Double bill of two popular animated adventures. 'Bambi' (1942) follows young male deer Bambi from his birth and woodland childhood with friends Thumper the rabbit and Flower the skunk, through to his ascendancy into tall, antlered adulthood. Along the way he tragically loses his mother to hunters and finds love with the beautiful Faline. 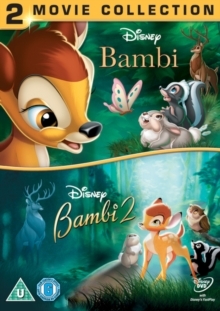 In 'Bambi 2 - The Great Prince of the Forest' (2005) Bambi (voice of Alexander Gould) reunites with his father, The Great Prince (Patrick Stewart), who must now raise the young fawn and teach him the way of the forest. But, in the adventure of a lifetime, the proud parent discovers that there is much more he can learn from his spirited young son.